The Olobobs are going to Big Fish's Pond today ... In the distance the pond looks very small but up close it's really BIG! 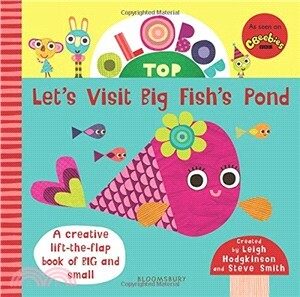 Lift the flaps and uncover the many wonders of Big Fish's Pond! Based on the hit CBeebies series, Olobob Top. Join Tib, Lalloo and Bobble on their exciting trip to see Big Fish and all things big and small. A brilliantly fun introduction to sizes and proportion for little ones with lots of lift-the-flap surprises. Help the Olobobs look out for small fish, big rocks and an even BIGGER boat. Other titles available: Make Your Own Olobob Home, The Amazing World of Olobob Top, Olobob And Friends Activity and Sticker Book, Let's Visit the Olobobs, Let's Visit Norbet's Shop.